Speakers of the conference sponsored by the French Committee for a Democratic Iran (CFID) included: Maryam Rajavi, the President-elect of the Iranian resistance, Rudy Giuliani, former mayor of New York and US Presidential Candidate (2008), Michael Mukasey, US Attorney General (2007-2009), Secretary Tom Ridge, the first US Homeland Security Secretary (2003-2005) and former Governor of Pennsylvania; John Bolton, former US Ambassador to the United Nations, Patrick Kennedy, member of the US Congress (1991-2011); Glenn Carle, former Deputy National Intelligence for Transnational Threats; Col. Wesley Martin, former Commander of the MNF-I anti-terrorism unit and commander of Forward Operation Base in Ashraf; Lt. Col Leo McCloskey, Commander of Forward Operation Base in Ashraf until 2008; Günter Verheugen, Commissioner of Europe (1999-2009) and former minister of State in the Department of Foreign Affairs of Germany; Gerhart Baum, former German Federal Minister of the Interior; Klaus Bresser, former Chief Editor of the German Channel 2 TV (ZDF); Jacques Desallangre, Member of French National Assembly; David Amess, Member of British Parliament; Lucio Malan, member of Italian Senate and NATO Parliamentary Assembly; Geoffrey Robertson, Q.C., LL.B., B.C.L., First President of UN Special Court on War Crimes for Sierra Leon and member of the UN Justice Council. Philippe Douste-Blazy, Special Adviser and Deputy to the UN Secretary General and French Foreign Minister from 2005 to 2007, also voiced his support for the goals of this conference via a video message. Mrs. Maryam Rajavi, the President-elect of the Iranian resistance offered her condolences to the French people, the Jewish society and the families of the victims of the terrorist attacks in Toulouse. She reiterated that this tragedy is the functionality of fundamentalism under the guise of Islam, and you find its roots in Tehran and Qom and we have warned about this phenomenon from a quarter of a century ago. This regime presents fundamentalism and terrorism under the guise of Islam, while these crimes have nothing to do with Islam. Thus, the only way to stand against it is an alternative based on a democratic and tolerant Islam. The PMOI represent this democratic alternative which is the anti-thesis to fundamentalism. An Islam with the message of mercy, freedom, equality, brotherhood, love, co-existence between all religions and all of humanity. In this conference which coincided with the Iranian New Year, Mrs. Maryam Rajavi, the President-elect of the Iranian resistance declared that with global solidarity, it is possible to turn the New Year as the year of defeat for the religious fascism ruling Iran. She added that the only solution to prevent an Iranian nuclear bomb or unprecedented conflict due to the mullahs' instigation of crisis is the regime change by the Iranian people and the Iranian resistance. Mrs. Rajavi said: "In order to escape their demise, the mullahs have reverted to war with the Iranian people, the people of the region and the international community. At the centre of these measures is their effort to annihilate the organized resistance who holds the key for change in Iran. Attacking Ashraf is done within this context". 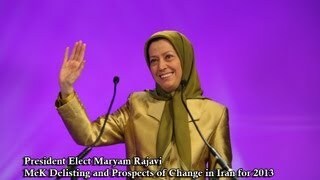 "The policy of the United States and the European Union, bowing to the demands of the regime about Ashraf and the continuation of unjustified designation of the Mojahedin (MEK) has worked in favour of the Tehran's mullahs", she emphasized. Referring to the transfer of 1200 Ashraf residents to Camp Liberty, Mrs. Rajavi said: "This transfer unfortunately has turned to a forcible displacement combined with a lot of harassments and pressures. Despite repeated calls of the Unites Nations High Commissioner for Refugees, the residents do not have the freedom of movement. They are also deprived of meeting their family members and lawyers. Most importantly, the unjustified presence of armed forces within the Camp's private limits has created constant insecurity for the residents. She further warned that the presence of armed forces inside the camp strongly adds to the potential for the occurrence of a humanitarian catastrophe. In these circumstances, the UN is expected to go back to its real responsibility of defending the victim and the oppressed or at least to stay neutral between the Iraqi government and Ashraf residents. The residents have the right to move their movable property to the new site and to sell other properties or to transfer them to another place. The refugee status recertification of the residents by the UNHCR and their relocation to third countries are expedited. 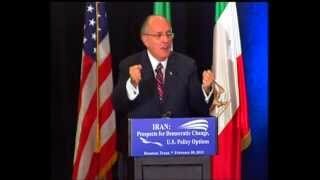 In his remarks Mr. Giuliani said: "Let me go there (Camp Liberty). Let me see it with my own eyes... In other words, let’s see if my country that I love, the United States of America, is living up to the promise that it made to the people of Ashraf to protect them and to treat them decently or it’s breaking that promise... And if you don’t want to send me, you can send Judge Mukasey or Tom Ridge or Patrick Kennedy or four or five of us and then you can put us before Congress and put us under oath and I assure you, we’ll tell the truth about it and we’ll get this resolved. Are we being misled or is the State Department breaking its promise to the people of Ashraf? Let’s get an answer to it once and for all." He added: "And right now, the enemy of stopping a nuclear Iran is appeasement. That’s the false notion that made Iran more determined to become nuclear. Let’s stop the appeasement. Let’s stop trying to negotiate. Let’s stop writing letters to the ayatollah. And let’s stand up, united as Americans in saying we are for regime change in Iran and we will take any step necessary to stop Iran from becoming nuclear." Beginning by the statement of his readiness to join Mayor Giuliani in his trip to Camp Liberty, Tom Ridge said: “we will continue to stand with the MEK, with freedom-loving people of Ashraf and Liberty”. He added: “I want to stand on the right side of the history and I do not worry about anything else”. He described the scenes of attacks of Ashraf and referring to the UN Charter, Universal Declaration of Human Rights and Geneva Conventions; he strongly criticized the US government and said: “How can my country ignore those vicious attacks? One wonders when last time those responsible for Ashraf looked at those documents." While addressing the United Nations he said "You have not done your job United Nations and it is about time you do it”. 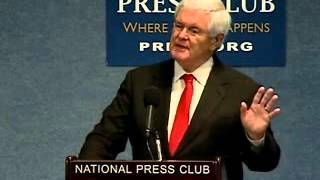 He ended by addressing the US government: “If you want to send a message to Iran and Maliki about how serious we are I give you one simple idea: delist the MEK”. Michael Mukasey said: “This conference should be broadcast to the State Department; then they would see that Mrs. Rajavi opened this conference by extending her condolences to the Jewish community in Toulouse”. He made ridicule of the anonymous sources at the State Department and said: “Why anonymous? What are they fearing of? They fear but we have no fear; we do not hide our names”. He ended by addressing the Iranian audience: “Right prevails in my country and I hope it will not be long before right will prevail in your country”.